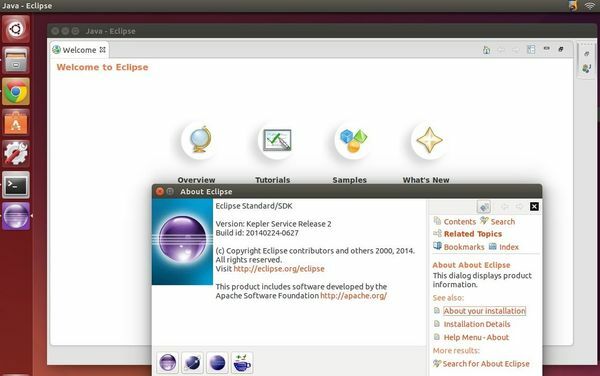 This quick tutorial is going to show you how to install the latest release of Eclipse, while the Ubuntu repositories has an very old version. So far, the latest is Eclipse Kepler (4.3.2). You can follow below steps to install it on Ubuntu 14.04 or other Ubuntu releases. Or, install Oracle Java from this link. You may replace “eclipse-*.tar.gz” (without quote) to the exact package name if the command does not work. Don’t like Linux commands? You can do this by opening Nautilus file browser via root: Press Alt+F2 -> run gksudo nautilus. Once done, you should see the eclipse folder under /opt/ directory. Press Ctrl+Alt+T, paste below command into the terminal and hit enter (install gksu from Software Center if below command does not work). Finally open Eclipse from Unity Dash search results and enjoy! I must admit that I’m having a problem– whenever I open eclipse, it shows the title screen and then the window goes white. To my knowledge I cannot find an error for it, it simply stops. Any ideas on why? Thanks for this useful information Ji! Wow ! That was quick and easiest way I have installed eclipse on linux. Thank you. Somehow software center has outdated version. Thanks! Worked for me as well on 12.04! tar: Error is not recoverable: exiting now ? The error output tells you that the package you downloaded is not complete. Remove it, and download again. I have used your method but when I start eclipse it hangs after splash screen. I am using 64bit ubuntu 14.04 and eclipse 4.4.
after that nothing happens. please help. Hi! Congratulations for this post, it’s very useful. But I have a bit problem, when I try put “gksudo gedit /usr/share/applications/eclipse.desktop” in the box and I press Enter, my system do anything. I dont know it can be. Who know it? Very sorry for that, I found that many readers don’t know how to use the Alt+F2 box. I have updated the step 4, please run the command in a terminal window instead. Hi ,could you explain me how i can remove eclipse after the installation with this guide? Just remove the .desktop file and eclipse folder under /opt/. You need to open your file browser with root to do that. Awesome job you did here mate! Last time I installed Eclipse by myself and ended up with a somehow working software only after a couple hours of work, and this time i got it smoothly in a matter of minutes. Many thanks for that. On my way to add ocaIDE and C stuff now… urg! I did all this, but whenever I try to run the program, it doesn’t do anything. Make sure that eclipse downloaded is of correct bit. I also had the same issue. My ubuntu was 32 bit. But I downloaded 64 bit eclipse. Check does it show and error in the console. Make sure it matches with your eclipse. Thanks! Very clear and useful instructions. Had me set up in no time! Very clear and worked first shot, thanks!!! Thanks a lot!!!!!! !.Got it for the first time itself. Eclipse launches with no problems at all but then the top menu (File, Help, …) doesn’t work, the submenus don’t drop. Do you know how to fix this problem? Your instructions are very good – but: You should add that you add a user group eclipse and give the folder /opt/eclipse to this user group. And set the chmod for read and write. With your instructions you can’t add any plugins to your installation of Eclipse! However, I ran into a problem on my machine where the installing java step failed due to a locked directory. By deleting the lock file, I was able to finish up successfully. 0 upgraded, 2 newly installed, 0 to remove and 368 not upgraded. Hi Ji, I followed your steps for install once extracted the tar file and put it in into the opt folder. When I right click and click the run option, the application doesn’t run anything. I am using ubuntu gnome version. Kindly help. The output will tell you what’s going wrong. Thanks for the tutorial, it is great. But I have one problem. It starts loading Eclipse Luna and after a second it shows ‘please see the log file’. “Update” fails on the same message. However, Ubuntu Software Center won’t let me add that repository either as deb or source. I think I got it. I unchecked the incorrect repository from “Available software sites” and then the update proceeded without a hitch. I did step by step from your tutorial. The only problem is step 4. When I enter gedit and paste, “Development” is mark with the red color. I’m new to the Ubuntu and I have 14.04.02 version. Also I have another problem with installing new software in Eclipse. When everything is done, just crashes at half of loading bar. That’s the Highlight Mode under Gedit Text Editor -> View menu, and it’s OK. Thank u ji m. The tutorial is very esay and first time i have install something manually(without software center). I get this all running (Ubuntu 14.10 64bit, Eclipse Luna). But if I want to install new software (over eclipse) I go to a valid Site and press enter. Now there should be some entries in the list below. But I cannot read them. I now they are there, ’cause I can select them with the select all button. Thanks. Worked perfectly for me on Ubuntu 14.04 64-bit version. Very Clear tutorial. Worked perfectly on Ubuntu 14.04 (32bits). Installed Eclipse Luna SR2. i am using eclipse 3.8 to run adobe flex builder in ubuntu 14.04 server.but frequntly eclipse crashing. I am new for eclipse. plz any one help me to solve this problem. Still working perfectly at date, thank you Ji m! apt-get install eclipse # you might want to run aptitude and select eclipse-wsp etc. You make a eclipse-lunar.desktop, not eclipse.desktop, because then you can have many different versions installed. Now you can have Eclipse installed in parallell with other installations of Eclipse. For minimal problems, do remember to use different workspaces depending on which version of Eclipse you run, I usually have the prefix ws-lunar- on each workspace. Now each user on your machine can use Eclipse Lunar. Awesome tips, thank you for sharing!! Thanks a lot for explaining clearly each step. It did work well for me. Hi! So far the best instruction I found. Thank you so much and please make more tutorials. You are great!! Thanks for your accurate instructions : i have reached the solution. This command is not working for my Linux. Actually, in opt folder, the two folders ‘Eclipse’ and ‘google’ have been created. But when I run the above mentioned command, it says that command not found: gksudo. How can I get to know the right path for my opt folder so that the above command might work for me? Does the path have something to do with the execution of this command?? Sorry, I forgot to mention that you need to install gksu before running the command. OpenJDK 64-Bit Server VM warning: You have loaded library /opt/eclipse/plugins/org.eclipse.equinox.launcher.gtk.linux.x86_1.1.200.v20150204-1316/eclipse_1607.so which might have disabled stack guard. The VM will try to fix the stack guard now. After following all the above mentioned steps, I encounter the message described below. Kindly help me out to resolve the issue. Thanks for this update, i installed the latest eclipse-php-mars on my ubuntu 14.04 but php support is grayed out for all my projects, new or old. Do you got any idea how to fix this, configure a path to php, or user rights? Very much helped. The most correct installation. It worked very well on Zorin Lite 9 Linux. You require JDK for eclipse. just FYI,I’m using ubuntu 15.10 and it didn’t show me the icon in the dash, reboot fixed it tough.